Alison Bashford and Carolyn Strange (eds. 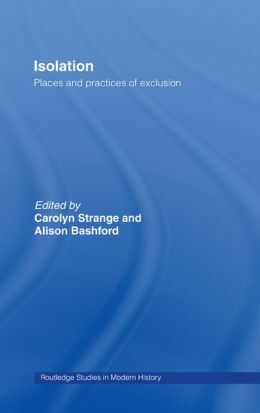 ), Isolation: Places and Practices of Exclusion, (London: Routledge, 2003). This book examines the coercive and legally sanctioned strategies of exclusion and segregation undertaken over the last two centuries in a wide range of contexts. The political and cultural history of this period raises a number of questions about coercive exclusion. The essays in this collection examine why isolation has been such a persistent strategy in liberal and non-liberal nations, in colonial and post-colonial states and why practices of exclusion proliferated over the modern period, precisely when legal and political concepts of ‘freedom’ were invented. In addition to offering new perspectives on the continuum of medico-penal sites of isolation from the asylum to the penitentiary, Isolation looks at less well-known sites, from leper villages to refugee camps to Native reserves.